If you have a little girl in your life who loves ballet, this is the perfect cross stitch pattern to delight and thrill her. Imagine giving this to her - especially if you've personalized it especially for her. These two digital alphabets are "historical" because they are based on writing that was common in colonial America, approximately 250 years ago. These 5 polka dotted digital alphabets are just plain FUN and have a multitude of uses! This lovely weathered wood alphabet includes 26 capital letters, 26 small letters and all 10 numbers. Be sure to click on the magnifying glass icon to see a closeup of these beautiful wooden letters. These 3 digital alphabets in black, blue and red are unusual because the insides of the letters are TRANSPARENT and so they will pick up the colors of your background. This spectacular medieval alphabet dates from the days when people (those few who could write) actually used quill pens! Click on the magnifying glass icon to see a closeup of these great letters. When have you seen a monogrammed alphabet that is more gorgeous or ornate than this one? 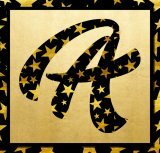 With this great package you get THREE amazing handwritten digital and printable alphabets in black, gold and black with brilliant golden stars. This very unusual digital and/or printable alphabet offers black and white letters on a background of stylized oak leaves. This unique digital alphabet and/or printable alphabet is black on a background of flowers, vines and swirls. How cool is that? Download this hilarious cat alphabet for a myriad of uses. These two medieval alphabets remind us of monks laboriously copying letters onto scrolls as they make gorgeous books that are worth fabulous sums today. We love the letters of this alphabet so much that we made three different versions! This simple printable and digital alphabet is made with simple black lines that are mostly empty space so that they will become ANY background color. These fancy printable and digital alphabet letters have a botanical background that look somewhat like stylized leaves. We call this our "wizard" alphabet and just a quick glance at these awesome letters tells you why we think of magic and powerful wizards. Look closely at this silver and burgundy art deco printable and digital alphabet. 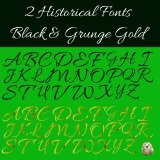 This printable alphabet has letters made of a medieval music score which is placed on a gold background. 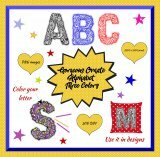 Look closely at this very unusual printable alphabet and you will see that the letters are woven silver strands with confetti in a multitude of colors. Wow! Look at the colors in this wild and crazy digital alphabet.